Second walk. 2014 the first Dhd Conference took place in Passau: DARIAH-Pre-Conference and another three days full of interesting talks. But everybody needs a break at any time – so I do. I used my break for a inspiring pattern walk starting at the university area we met. 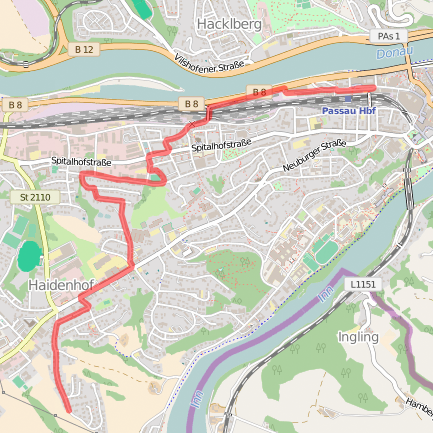 My walk had some loops in the beginning because of the many small trails on the campus area and less possibilities to turn left because of the river on my left hand side. Around 30 minutes the situation twisted and I had to walk along the Inn with no possibilities to turn right. 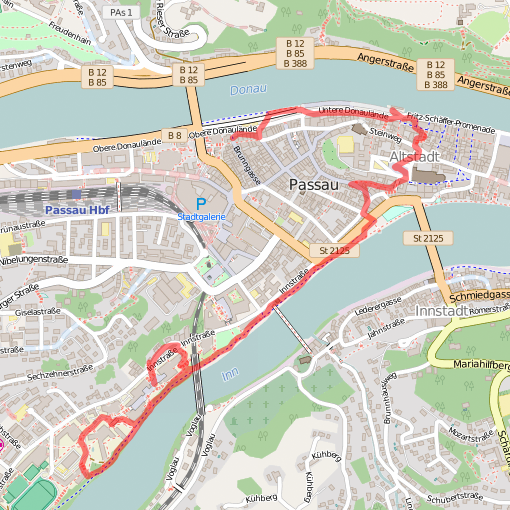 But in the end I reached the old city centre of Passau and stopped my walk after 20 iterations of my walking algorithm in Passau’s Bratfischwinkel. Why 20 iterations? 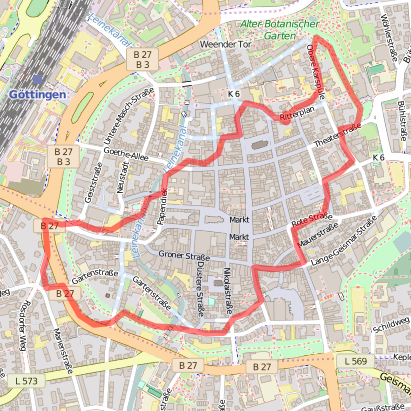 Remember: That’s the number of iterations of my first walk in Göttingen which brought me back to my starting point. It’s time to start a new art project: PATTERN WALKING. PATTERN WALKING has a double meaning: walking through a city entailing a specific rule or pattern on your walk and generating a pattern while doing this. It’s a project inspired by psychogeography explored by artists like Guy Debord in the 1950s or newer approaches of alternative ways of tourism, coming into vogue under the label experimental travel. It’s about exploring the urban space in an alternative way, discovering things you otherwise wouldn’t have discovered. Because of trail tracking apps that allow tracking your undertaken walk through the city of your choice, you explore the urban space twice: first while you’re walking using a particular rule like turning alternating right and left, second when you’re looking at the specific pattern of your walk on a map. First walk. Starting at my front door, turning right, left, right, left… Scary experience: Walking through Göttingen following this simple rule, you won’t walk in a zig-zag-pattern transverse the city but in a loop. It’s true: Today Daniel and me started at Ritterplan 3 and ended up at Ritterplan 3 after 20 iterations of the chosen right-left-pattern for that first test walk.